A product design and development firm based in Knaresborough has expanded its team thanks to a strong growth in business. GSPK Designs has taken on two graduates to help deal with its increasing workload – and bring new skills to the existing team of 12. The new recruits are Joe Hodge, an electronic design engineer, and Tim Chamberlin, who will be the firm’s first industrial design engineer. “We have had several new contracts and there are more jobs in the pipeline, so we needed more people to ensure we can keep delivering the best possible service to our loyal clients, and to those who are joining us. 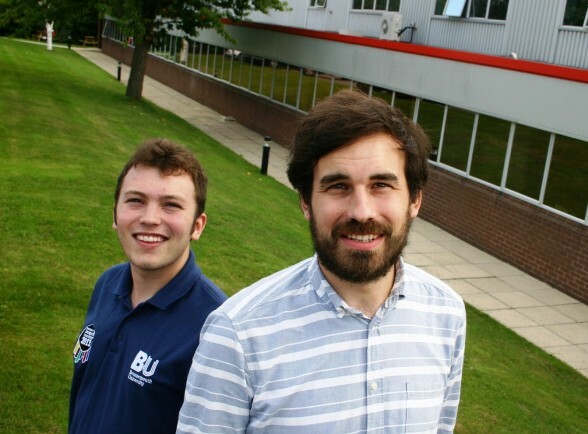 “Bringing two recent graduates on board means we have fresh ideas and the latest knowledge. Joe, 32, was recruited after completing his engineering degree at the University of York. He went to university as a mature student after spending several years working in sales for a computer company. Just three weeks into the job, he is already working on a live project and is enjoying the chance to be creative with technology. For Tim, the job is not unfamiliar territory: he completed a year’s placement at GSPK Design last summer, before going back to the University of Bournemouth for the final year of his product design degree. When he came home to Knaresborough for the summer, Paul called him in to talk about a more permanent role – and he too started work in early August. “Until now, we have had to work with outside partners for our industrial design and 3D modelling work. So successful was Tim’s placement that Mr Marsh has taken on a new student this year. He first met Olly Lucking three years ago at an event run by Young Enterprise, an educational charity which aims to inspire the next generation of business leaders through practical challenges. Mr Marsh, who is chairman of the Young Enterprise board in North Yorkshire, was impressed when Olly contacted him earlier this year to ask if he could come to GSPK Design for a placement as part of his business development degree at the University of Liverpool. Having recently spoken to sixth form students at King James’s School in Knaresborough about different ways to find opportunities and meet business leaders, Mr Marsh thought Olly had the right approach. “That’s exactly the kind of attitude I look for in young people. “Anyone who uses their initiative and builds up useful contacts like Olly did will catch the eye of a potential employer.